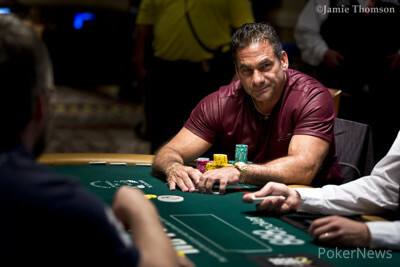 James Calderaro has accomplished a lot on the poker felt. He ran deep in the 2009 World Series of Poker Main Event, just missing the final table with a 13th-place finish. He has a WPT title under his belt and several other six-figure scores over the years. 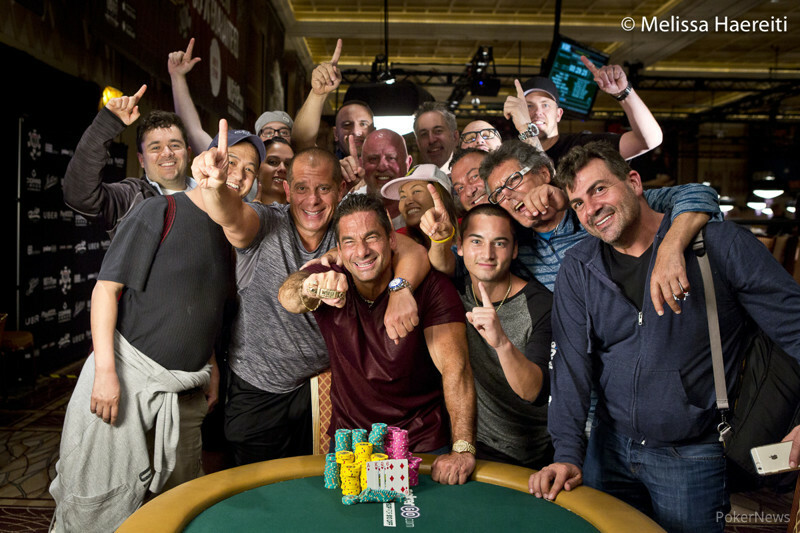 Early Saturday morning, Calderaro added a WSOP bracelet to his list of accolades, besting a field of 205 in Event #67: $25,000 Pot-Limit Omaha 8-Handed High Roller. For Calderaro, the win and the money won are something to be proud of, and having his son Anthony there for this moment made it that much more special. 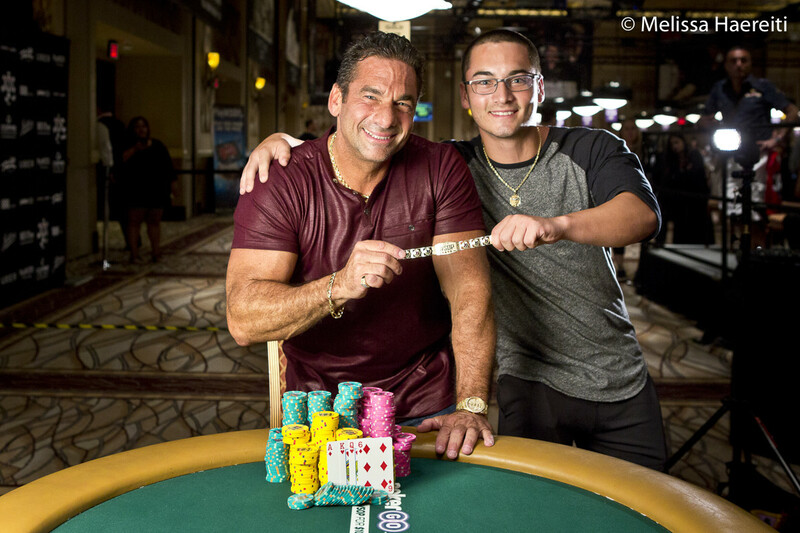 "The bracelet is amazing to me," Calderaro said after taking winner photos. "I had my WPT Championship and I gave it to my firstborn son, and I promised my second son and my daughter they would get the next ones. So my second son got the bracelet. Now I have a granddaughter, so now I gotta get two more, so I can't quit. It means everything to me. My boy right here, his bracelet right here in the World Series, him being here with me, it means everything to me." Calderaro was sixth in chips after Day 1, second in chips after Day 2, and was in excellent position to contend for the bracelet on Day 3. Not long after play began, he was on top of the chip counts following a massive hand against chip leader Iraj Parvzizi, who had held the chip almost the entire tournament. Calderaro flopped a monstrous hand with the nut straight and top two pair, getting it in against Parvizi and a shorter stack. Calderaro's hand held up, giving him about 30% of the chips in play with 14 players remaining. "He (Iraj) is crazy, I love playing with him. I got friendly with him. He's just a wildcard, he's crazy. He loves to play and loves to gamble, and I love to gamble. I feel like I'm playing a cash game when I play with that guy. We got involved in a hand...I loved the spot I was in, and I couldn't believe he repotted it after I potted it. He's used to winning those kinds of hands, and that's how he got his chips throughout the tournament, and this time it didn't pan out for him." From there, Calderaro went into the final table holding the chip lead. The rail became loud and boisterous, especially with three players remaining. There were sizable cheering sections for Calderaro, runner-up Alexey Rybin, and third-place finisher Esther Taylor. Emotions ran high and things became contentious numerous times among the many fans for each player. Calderaro did his best to soak all of the raucousnesses in. "Oh I loved it. It makes it even more enjoyable for me, because as you know I like to shuffle it up, get people going, talk to them and everything else. So as far as getting into the loudness and wildness, that's usually my game anyway. I like to talk at the table, I like to go crazy, and I like to get people to talk. I get people to laugh and have a good time because otherwise, it's boring. I like getting wild and stuff like that." The tumultuous three-handed battle saw Taylor battle valiantly with a much shorter stack than her opponents, but ultimately bow out in third place. Calderaro began heads-up play as about a 2:1 underdog, but never had any doubt about the outcome. Even earlier in the final table when things looked bleak after losing a crucial hand to Rybin, Calderaro turned to his dejected rail and told them everything would be okay. "I never thought I was losing. Especially when I lost the aces to the aces, my rail... their faces ... and everybody else looking down...I looked at my boy in the eyes and said it doesn't mean nothing. I'm not losing this. I knew I wasn't losing this. I knew how much chips I could lose on that hand. I played that hand horribly, I should never have played it like that. But I really believed I was winning this thing hands down, from the get go. From the time I walked in today, from the time I started playing." Calderaro never wavered, never gave up, and never stopped believing that he was going to share this moment with Anthony. Alexey Rybin raised to 700,000 and James Calderaro three-bet the pot. Rybin announced a reraise and Calderaro moved all in to pick up a call by Rybin. Calderaro's rail asked for a king and got their wish granted on the flop. Rybin was in need of the case queen or a jack for the straight, but the turn and river failed to improve the Russian. 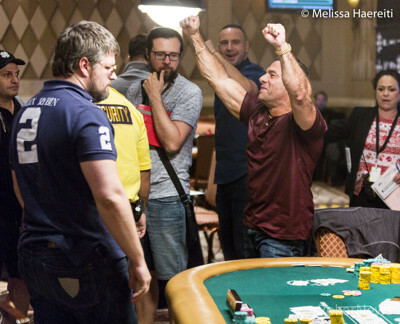 Rybin was eliminated in 2nd place for $796,706 while Calderaro's rail jumped from their seats to celebrate. Calderaro will receive the elusive gold bracelet and a first-place payout of $1,289,074. A recap of today's action will be available later tonight. In a limped pot, the flop showed and both players checked. 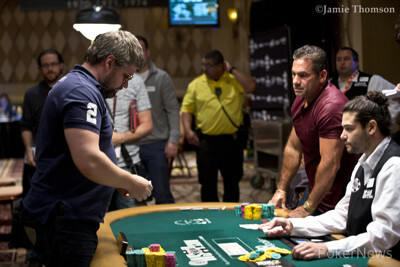 Alexey Rybin also checked the turn and James Calderaro bet 400,000, which Rybin called. The fell on the river and Rybin bet the pot for 1,280,000. "Queen nine is basically the only hand you can have," Calderaro said and took his time before calling. Rybin rolled over for a full house and Calderaro mucked for a flush. Alexey Rybin raised to 700,000 from the button, and James Calderaro called from the big blind. They checked to the turn of the board, where Calderaro bet 1,000,000. Rybin folded, giving Calderaro the pot. Alexey Rybin raised to 700,000 from the button, and James Calderaro made a pot-sized three-bet to 2,100,000 from the big blind. Rybin called. The flop came , and Calderaro instantly announced a pot-sized bet of 4,200,000, putting Rybin to a decision for most of his remaining chips. He quickly folded, and Calderaro took the pot. The players are on a quick break. Alexey Rybin raised to 500,000, and James Calderaro called. On the flop, Calderaro bet 750,000, and Rybin called. After the turn, Calderaro bet the pot, Rybin moved all in, and Calderaro called. Calderaro was freerolling with the better diamond draw, and the river blanked to chop it up. Then, Calderaro made it 500,000 to go, and Rybin called. On the flop, Rybin checked, and Calderaro bet 600,000. Rybin check-raised to 2,800,000, and Calderaro was sent into the think tank. "That's a good one," he said to his rail,"
Rybin replied, "Let's finish it," followed by a, "Take your time." Calderaro then called one minute later, and Rybin moved all in after the turn. Calderaro quickly called. The on the river was a blank, and Calderaro doubled for 4,785,000 while his rail erupted in massive celebration.